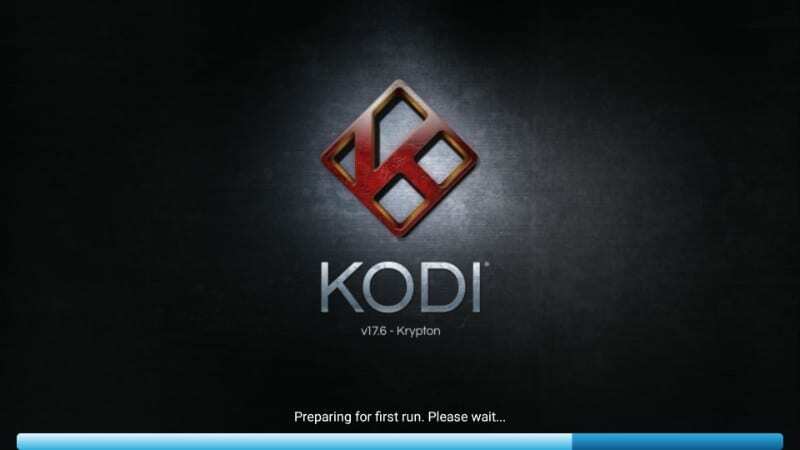 In this article, we will learn how to reset Kodi 18.1/18.0 Leia or Kodi 17.6 Krypton to default factory settings on FireStick. Kodi is an incredible media tool that converts your device into a media center and lets you stream your favorite content – free and paid (of course, free for the most part). But, this free and open-source platform isn’t devoid of problems. Especially, the long-time users who have multiple Kodi addons installed, run into performance issues number of times than they would want to. There are several hacks and solutions that help speed up Kodi and fix the performance-hampering bugs. But, there are times when none of the solutions work and resetting Kodi to default remains as the only viable option. Resetting the app gives you the clean slate to start with, as if you were running Kodi for the first time. But, remember that it also means losing all the Kodi data, such as your Addons and settings. This too can be taken care of, albeit to a certain extent. 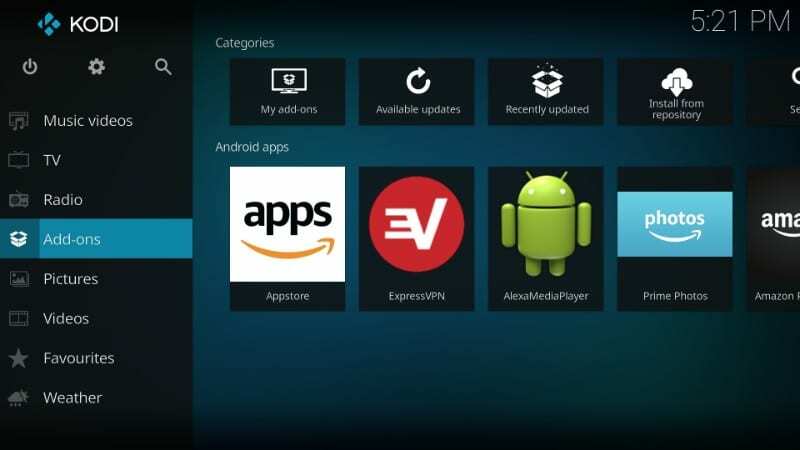 This article is also for those who just want to start using Kodi over from the beginning without having to go through the process of uninstalling and reinstalling the application. For instance, if you have installed too many add-ons and builds over time and don’t use most of them anymore, instead of removing them individually, you may sweep Kodi clean with a quick reset and set up the handful of add-ons you would like to use. 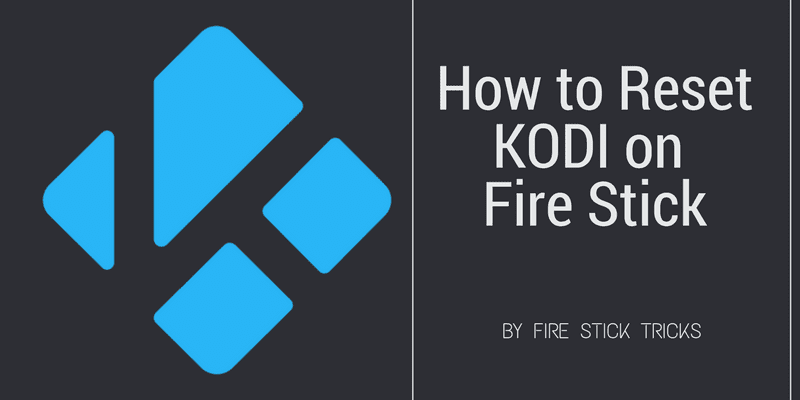 In the upcoming sections of this article, we will talk about how to reset Kodi on FireStick, how to back up and restore your data, and everything else you may need to know. Keep reading! If you have been using Kodi on FireStick for a while, you may have already installed some add-ons, builds, and customized several settings. When you reset Kodi to default factory settings on FireStick, you lose all the Kodi data, including all your add-ons and customizations. Setting up all of it again could be some hassle. Not only it takes time, you may also not even remember your previous settings. If all you want is to simply get started from scratch, there isn’t a lot you need to do. Just reset Kodi and you are good to go. However, if you do want Kodi back somewhat the way it was, I recommend taking a backup before resetting it. 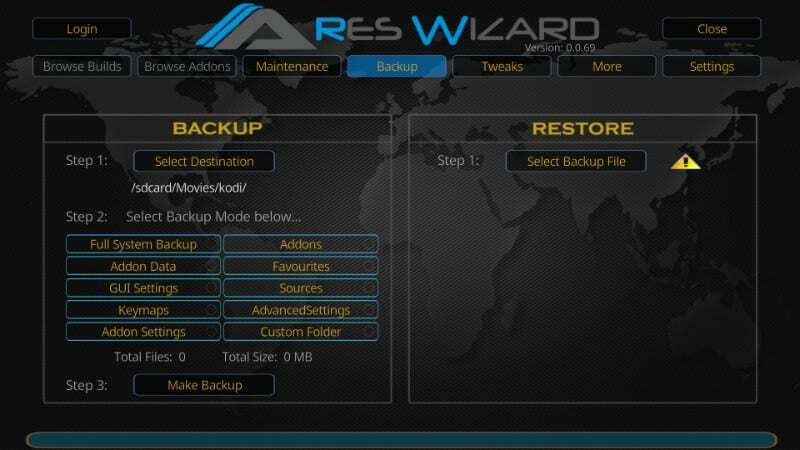 Note: There are several add-ons that let you back up and restore Kodi. None of them offer fool-proof backup solutions. For some reason, the addons recover only a part of the backed-up data during restoration. Yet, it is better to retrieve something than lose everything. 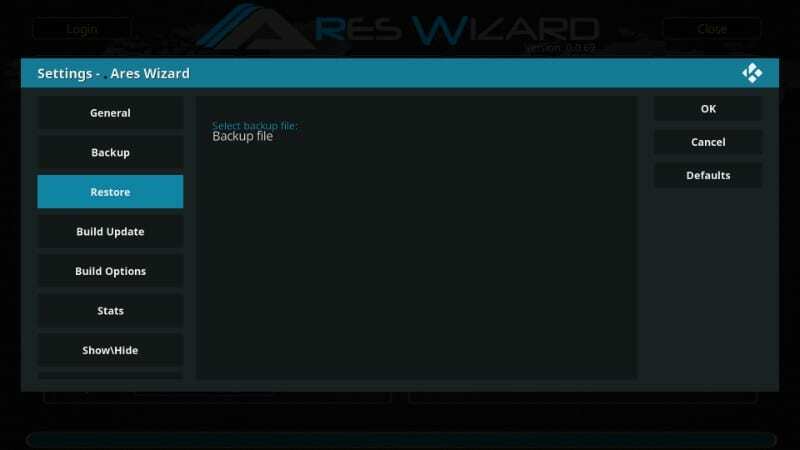 Before you reset Kodi, I recommend making a note of everything you would like restored so that you may set it up later manually, in the event the entire data is not recovered automatically. 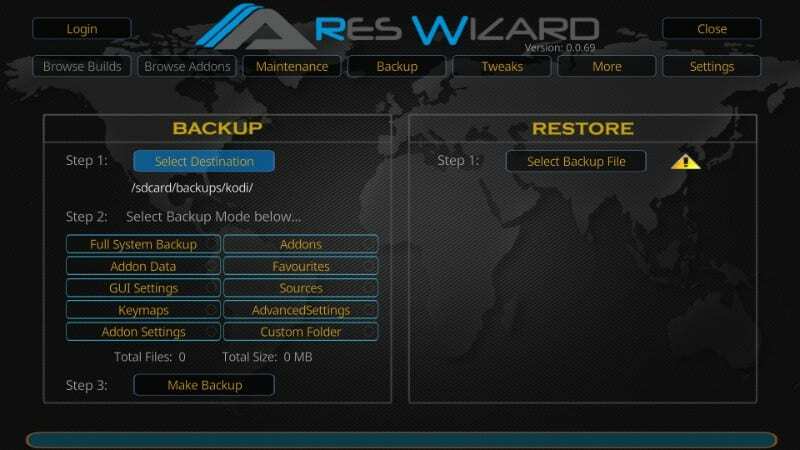 When it comes to Kodi data backup, we have found Ares Wizard the most effective one. It restores most of the backed-up data and is easy to set up and use. 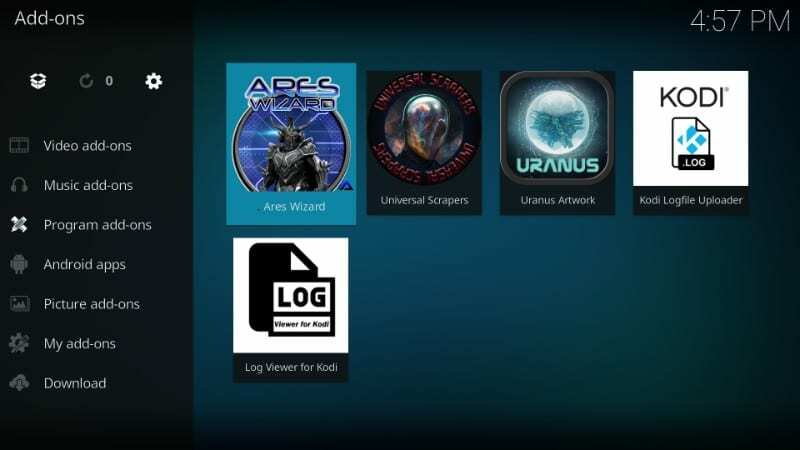 You can learn here how to install Ares Wizard on Kodi. 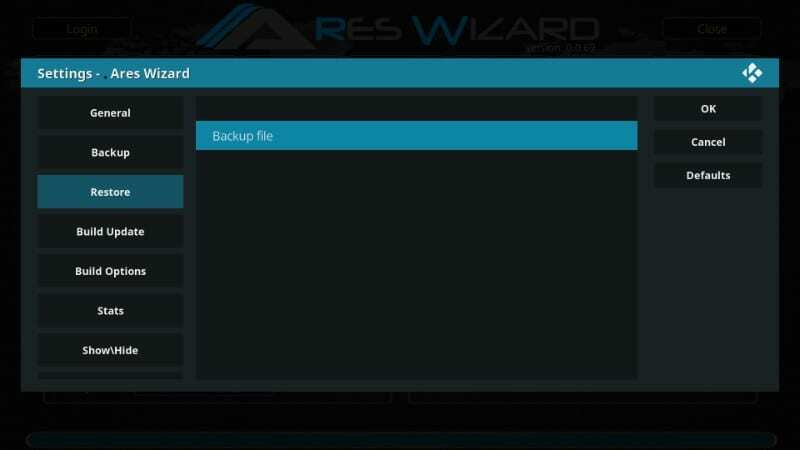 Once you have Ares Wizard, here is how you can back up your Kodi data. #8. 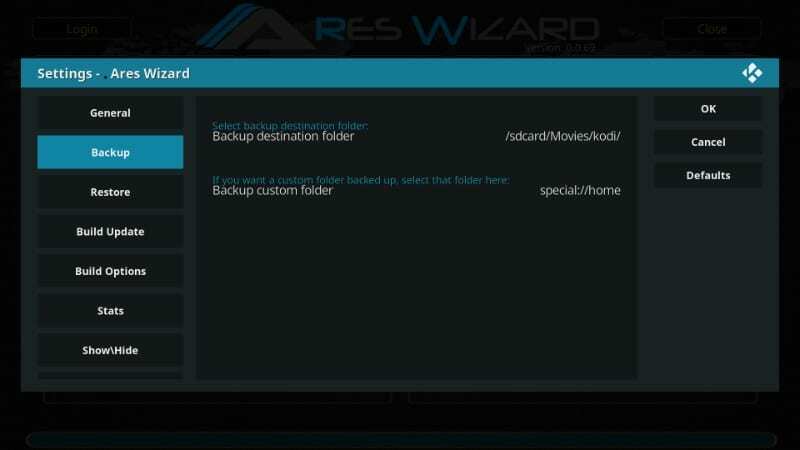 Now you can select any folder on your FireStick device where you wish to save the Kodi backup data. FireStick already has a ‘backups’ folder so I keep my backup files here. But, you can choose any existing folder you want or create a new one by clicking ‘New Folder’ button on the right. #9. I created ‘kodi’ folder inside backups. 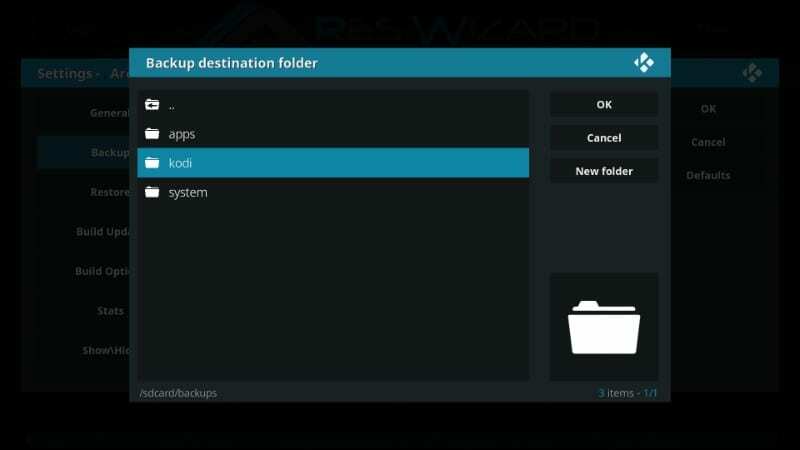 The Kodi backup folder does not exist by default. #10. 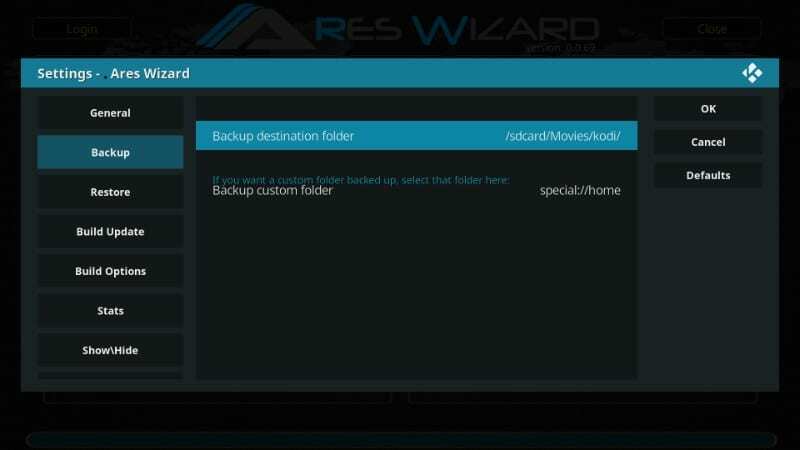 Now, open the ‘kodi’ folder you just created inside backups folder (you will not see anything in it as we haven’t backed up Kodi yet) and click ‘OK’ button to select it. #12. 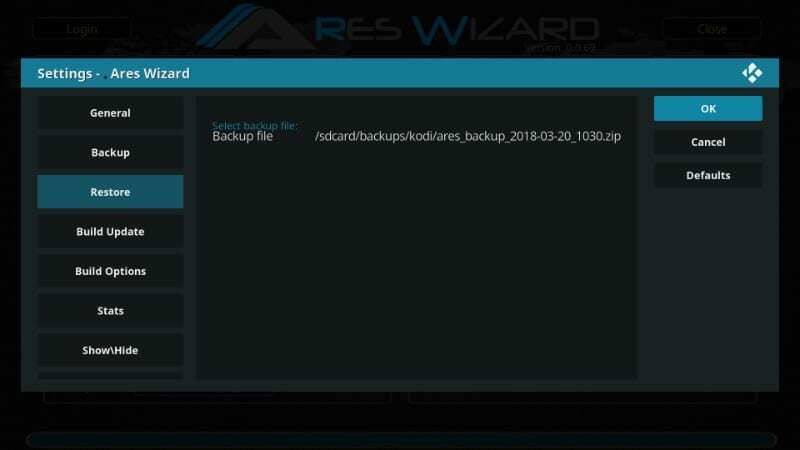 When you are back to the Ares Wizard interface, you should see the ‘Refresh’ option under ‘Backup’ (that’s because you have chosen a new destination folder). Click the ‘Refresh’ button. #13. 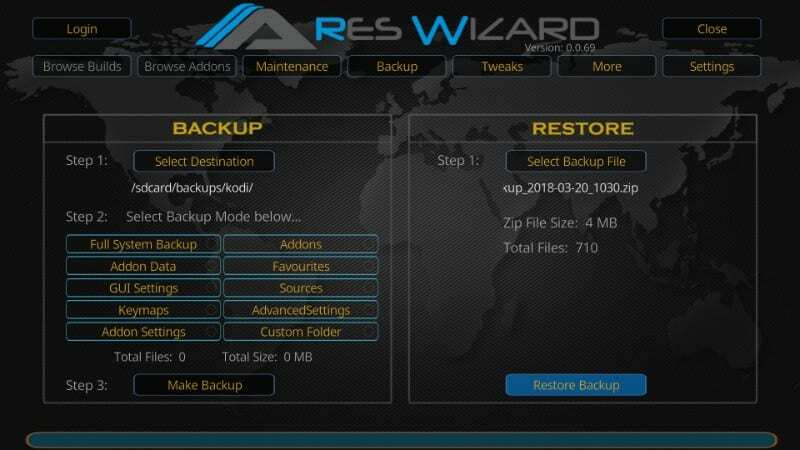 Now Ares Wizard is updated with the new backup destination. 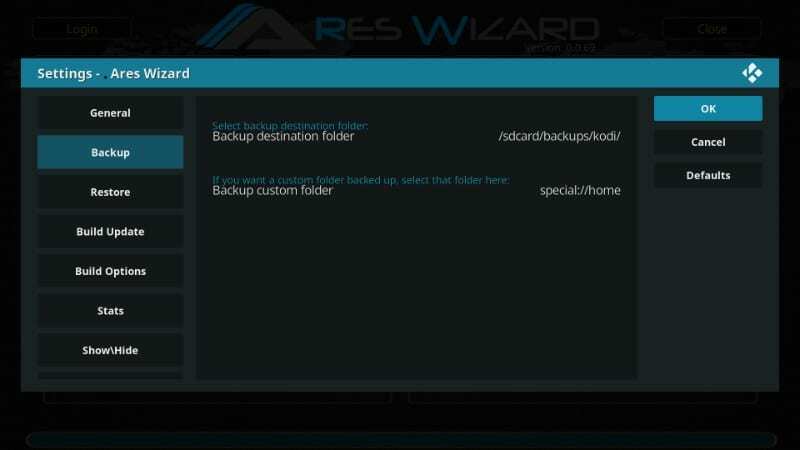 As you can see in the image below, you can choose what Kodi data to back up and what to leave out. If you want to back up everything, select ‘Full System Backup’. If you just wish to back up your Add-ons, select ‘Addons’ and leave everything else unchecked. Once you have made the choice, click ‘Make Backup’ button. #14. 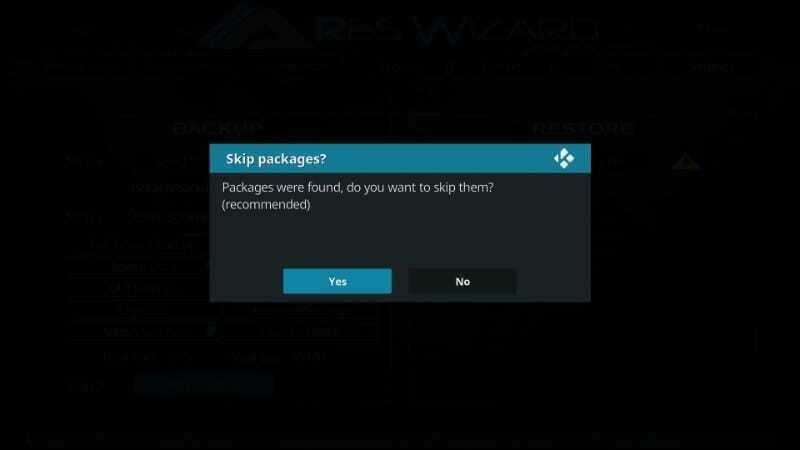 You will see a prompt asking whether you wish to skip or back up the packages. Every time you update an add-on or install a new one, a package is also downloaded. After the update or installation, you don’t need the packages any longer and they continue taking up space on your limited FireStick storage. Always click ‘Yes’ to Skip the packages as you don’t need them anymore. #15. 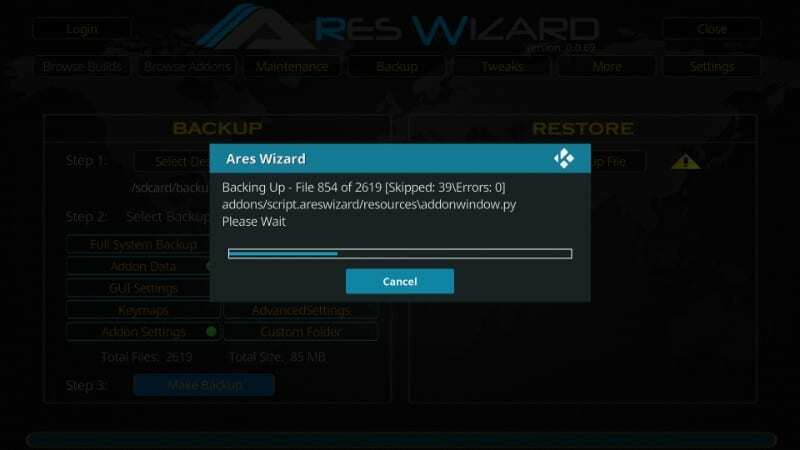 Ares Wizard will start backing up Kodi. This is how the progress will look like. #16. 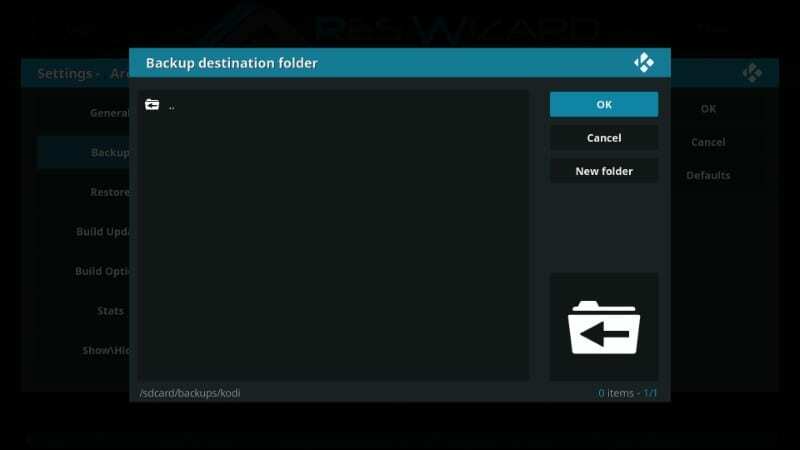 When Kodi is backed up, a pop-up will ask you whether you wish to view the skipped files. Click ‘No’ to proceed (or select ‘Yes’ if you really want to see the skipped files). And, don’t forget to ignore the total size of the skipped files this prompt shows. As you can see, the number is incorrect (36722318 MB converts to 36722 GB, which is nearly 4600 times the maximum 8 GB size of your FireStick device). It is clearly a glitch. In the next section, we will learn how to reset Kodi. In the following section, we will see how to restore it. There are two ways to reset Kodi. One is to clear the Kodi data without uninstalling it. 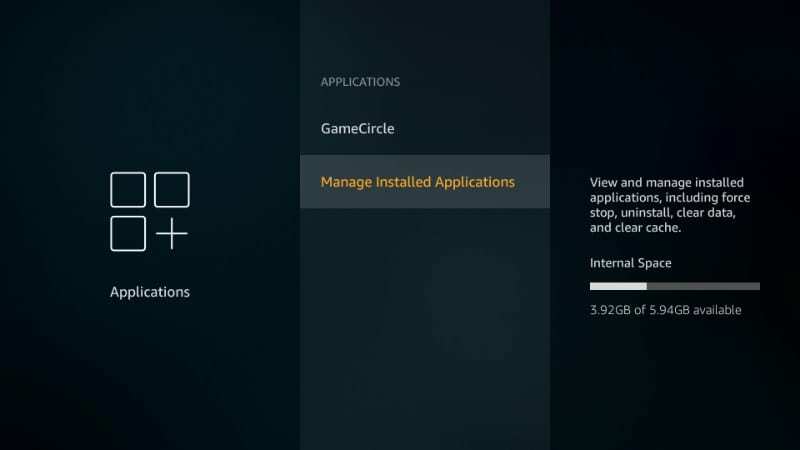 The other is to uninstall the app from FireStick and remove all the associated data along with it. We will take a look at both one by one. This is how Kodi looks like with all your installed Add-ons ‘before’ reset. We will now learn how to clear data on Kodi. 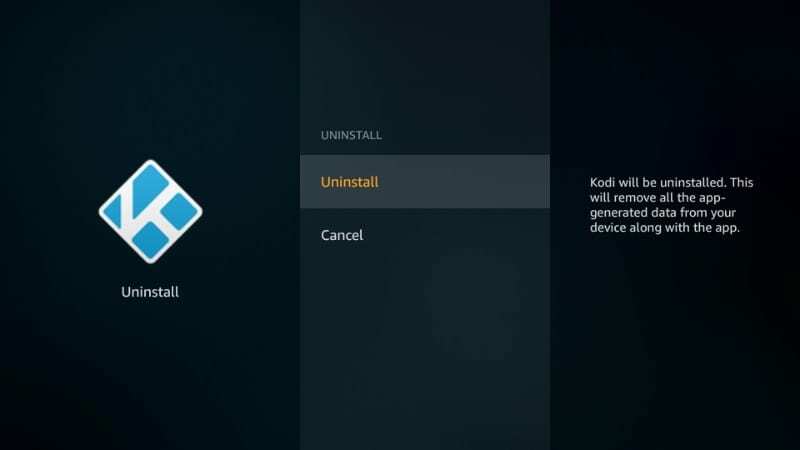 This method is simpler and almost effortless as it eliminates the need to uninstall Kodi, which is an additional step. Clearing data will keep Kodi on your FireStick but remove all your add-ons and their settings, customizations, Kodi settings and everything else. So, if you want to know how to reset Kodi to factory settings, simply clear the data. I will show you how. #1. 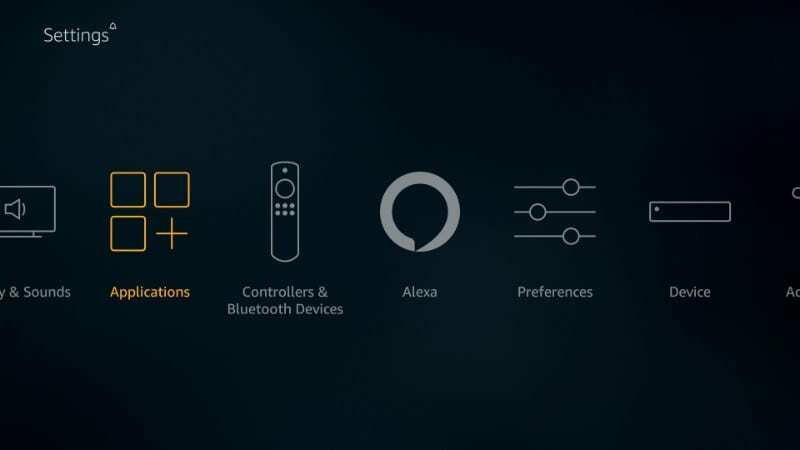 Use your remote to select ‘Settings’ on the top menu on your FireStick home screen. #5. On the next screen click the ‘Clear data’ option. 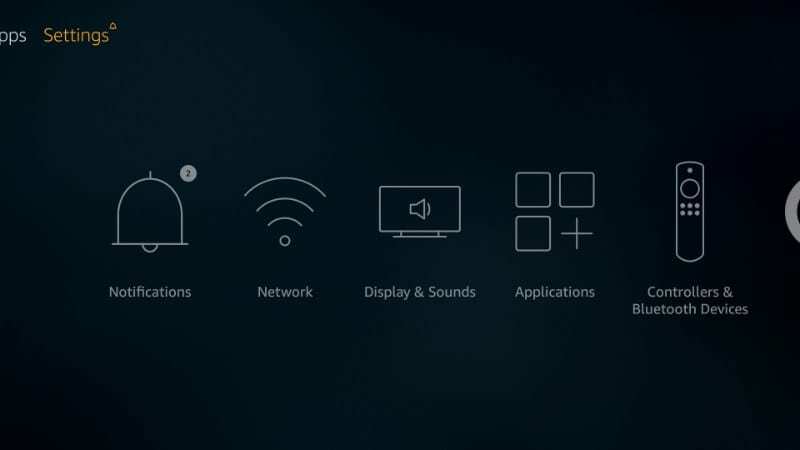 On the right, you can also see additional information about Kodi on your FireStick including the amount of storage it is consuming. In the image below, Kodi app itself is taking 164 MB space, while the associated data is of 125 MB size. #7. Press the back button on your remote just once to go back to the previous menu. You will see on the right that the Kodi data has been cleared. #8. Return to the home screen and go to ‘Your Apps & Games’ section. Run Kodi from there. You will see ‘Preparing for the first run’ (see the image below). This means that all the Kodi data has been cleared and you have reset Kodi to default. #9. When you go to the Add-ons section from Kodi home screen, you see that all your Add-ons have also been removed. Kodi is now as good as new. In this part, we learned how to reset Kodi on FireStick by clearing the data. In the next method, we will see how to remove Kodi from FireStick. So, let us see how to uninstall Kodi on FireStick. #1. Like in the first method, select ‘Settings’ from the FireStick home screen and click ‘Applications’ from the menu. 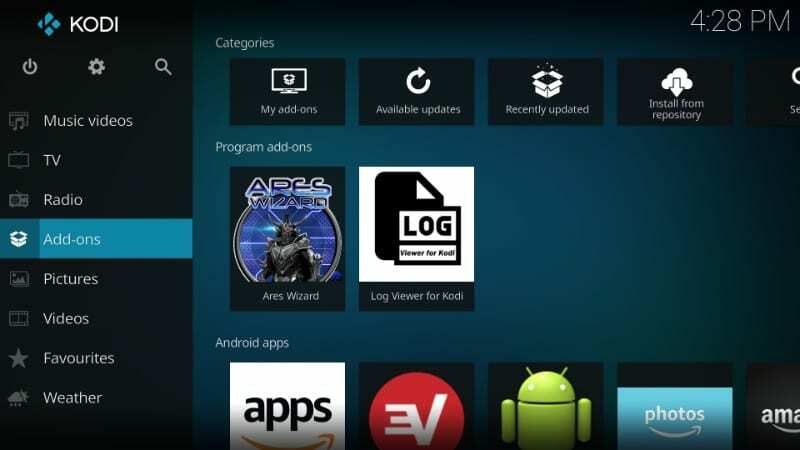 Now click ‘Manage Installed Applications’ and then select ‘Kodi from the list’. #3. Click ‘Uninstall’ one more time on the next screen to confirm your action. This will remove Kodi from your FireStick device. 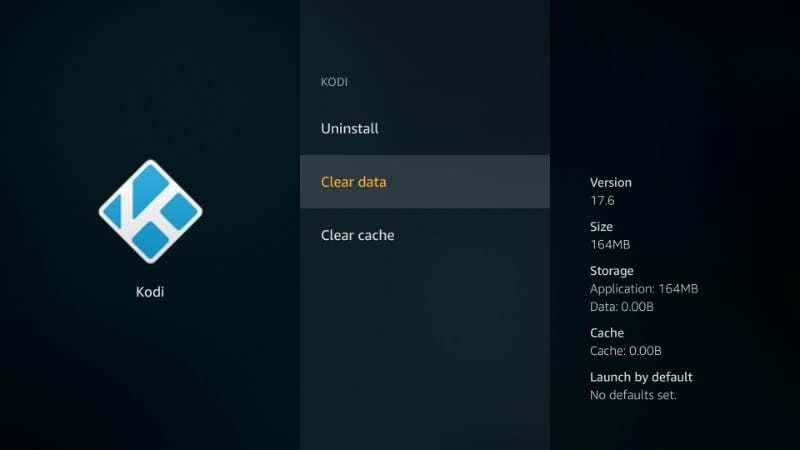 When Kodi is reinstalled, all the data will have been removed. Now to reinstall the Kodi app, go here to learn how to jailbreak FireStick with Kodi. 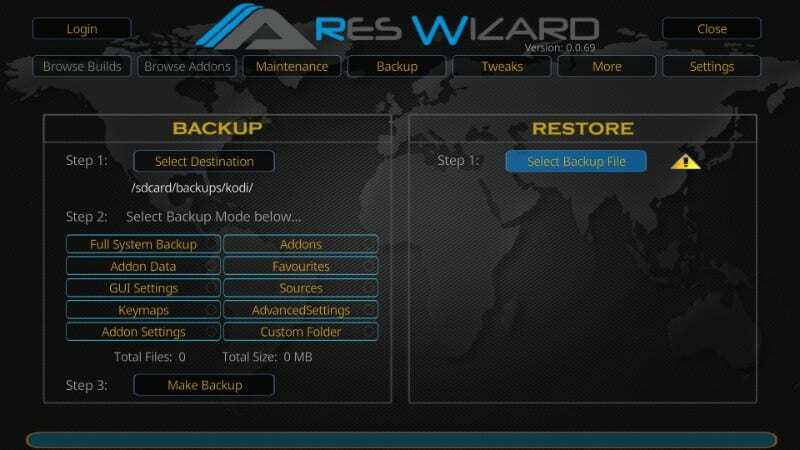 Now that you have reset Kodi, you will want to restore the backup you created in Step 1. 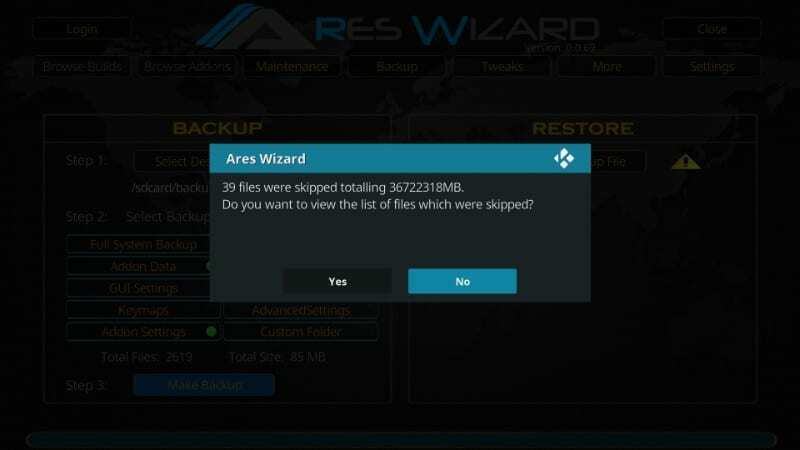 Since you backed up with Ares Wizard, you will need Ares Wizard again to restore the data. During the reset process, all your add-ons will be removed, including Ares Wizard. Therefore, it has to be installed again. 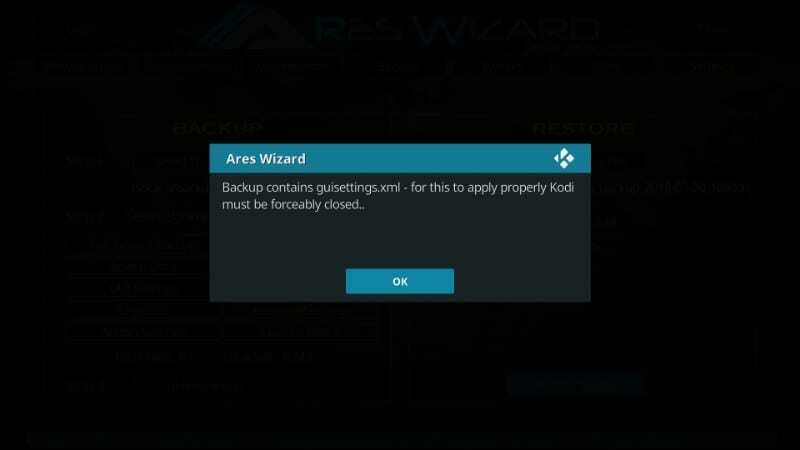 You can read this to install Ares Wizard on Kodi. #4. 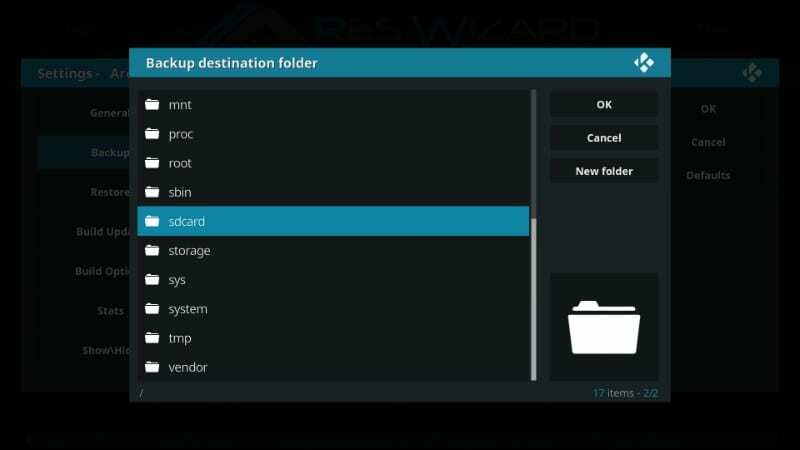 Now open ‘Root filesystem’ and navigate to the folder where you backed up the Kodi data earlier. In my case it would be Root filesystem > sdcard > backups > Kodi. #8. 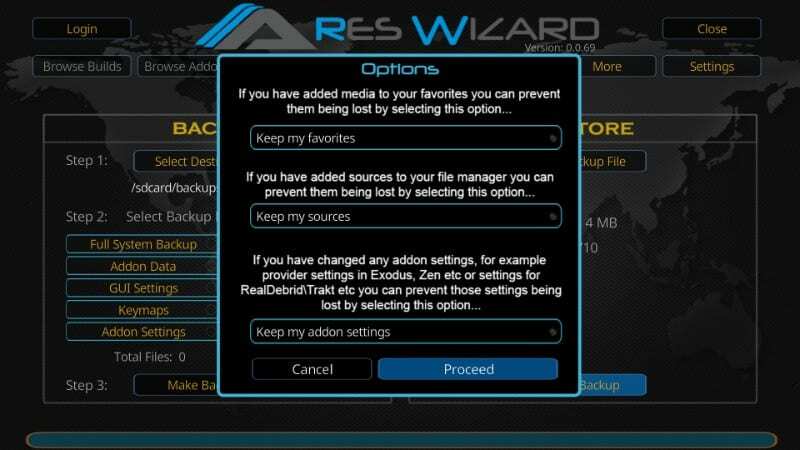 If you have changed any settings since you reinstalled Kodi after the reset and wish to retain them, select the desired options on the following pop-up and then click ‘Proceed’. If none of the options are selected, your current settings may be overridden. #9. When the Kodi data is restored, you will see ‘Restore Completed’ confirmation. Click ‘OK’ to continue. #10. For the guisettings.xml to apply properly, Kodi will have to be force closed. Click ‘OK’ to do that. This will take you back to the FireStick interface from where you can relaunch Kodi. #11. Go back to the Kodi home screen. As you can see, not all the add-ons have been restored. This validates what I said earlier, that the data is backed up only partially. Sadly, this is the best we can do. But, it will still save you some time and efforts as you don’t have to set up Kodi all from scratch. 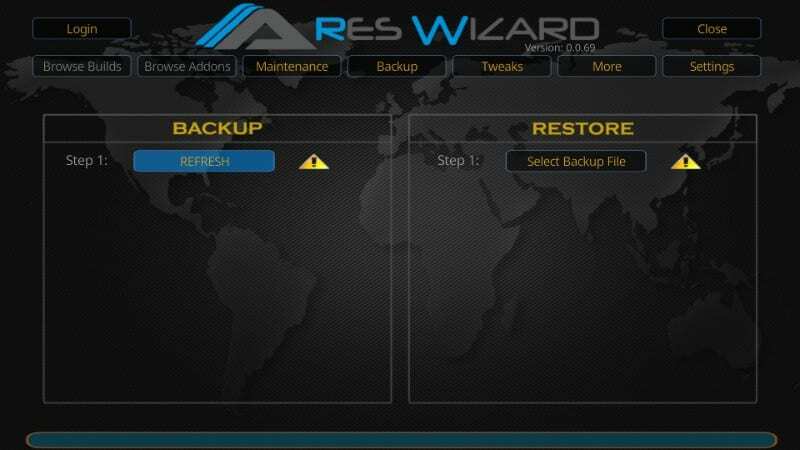 As I mentioned before, Ares Wizard will restore the data but it may not be the complete data you had before resetting Kodi. So, if you are missing some Add-ons or builds that you need again, you can always reinstall them. You can check the following resource links for adding Add-ons, Builds, and apps. So, now you have learned, how to back up Kodi data, reset Kodi, uninstall and reinstall Kodi, and how to restore Kodi data on Fire TV / Stick. 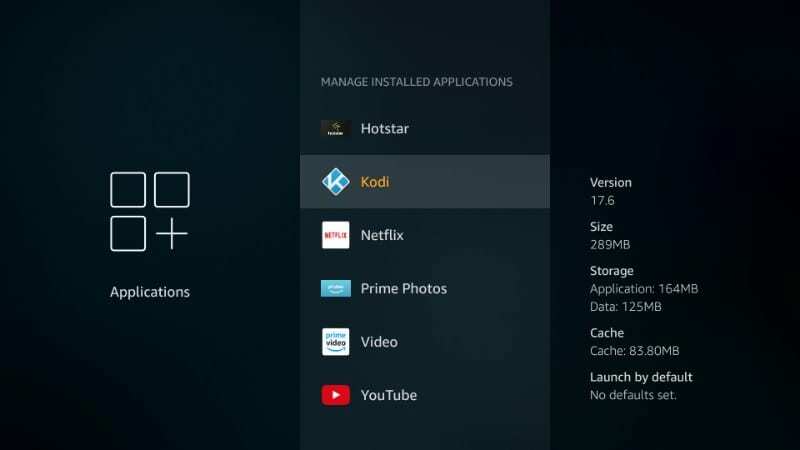 Resetting or removing Kodi will certainly improve the performance and clear up some space on your FireStick storage as well. Or, if you feel your Kodi app is thronged with all the add-ons and builds you don’t even use any longer, resetting might just be the right way to go. 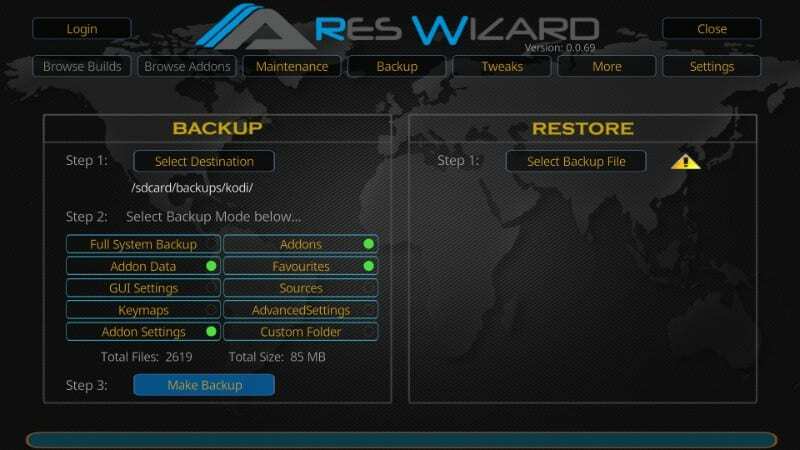 I have always used Ares Wizard for backing up my firestick config. It works great with all versions of Kodi 17 However it does not work with Kodi 18. It will not allow you to select a backup location. Every time you select a location it will not keep that location. It just keep asking you for a location destination. Any ideas or work around you can recommend. Yes, Frank, it also won’t let me select the destination folder. I couldn’t find a workaround. I hope it is fixed soon.